ValleyFair Dental is conveniently situated in the heart of Maple Ridge! When you come in for a cleaning or dental appointment with us, take the family out for lunch or do some shopping before or after your appointment ─ there’s lots to choose from! We’re in a mall with London Drugs and Save-on-Foods ─ so you can get your errands and dental work all done in one convenient location. If you’re looking for some restaurants to visit with your family when you come to ValleyFair Dental, here are our top staff recommendations for you to choose from. Frogstone Grill is just down the street from ValleyFair Mall. This grill is a landmark restaurant in Maple Ridge, it’s been a part of our community for almost 14 years! Did you know that Frogstone Grill has an interesting history? Owners Todd and Shari Pratt used to raft along the river and got to know many areas, including one called “the frog”. This massive rock looks like a giant frog on a stream with the water flowing around it. “The frog” has stood the test of time as it was originally named by the natives hundreds of years ago. This rock inspired Todd and Shari Pratt to open Frogstone Grill and it’s been a part of our community for so long ─ it really has stood the test of time. With a unique blend of casual and exotic flavours, like Cranberry Tea Chicken, you’re sure to find something delicious for each member of your family. From pastas, to burgers to steaks, Frogstone Grill provides dishes that are perfect for the whole family in a casual and comfortable dining environment. Visit this landmark in Maple Ridge when you book your appointment at ValleyFair Dental! You can book appointments for the whole family and then enjoy a great afternoon or evening out. Ask Shannon for her dish recommendations when you visit us for your dental appointment. She and the ValleyFair staff would be happy to share their favourites! 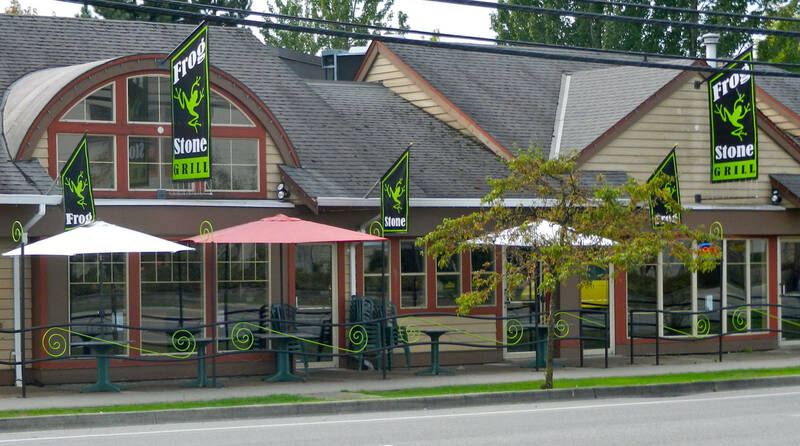 Frogstone Grill is located on 22932 Lougheed Highway in Maple Ridge near the intersection of Lougheed highway and 228th street. This grill is open seven days a week, with similar hours to ValleyFair Dental. If you’re in the mood for excellent Italian cuisine, check out Paliotti ─ recommended by our friendly office manager, Julie! Located close to ValleyFair Dental, Paliotti’s Italian Restaurant has a roof shape similar to a circus tent so it’s hard to miss. When Joe Paliotti first found this building, it was an old drive-in burger joint. He then converted the building to a sit down restaurant but left the original and unique roofing. Over the last 34 years, three generations of Paliotti’s have been serving large portions of great Italian food with complimentary bread and dip. 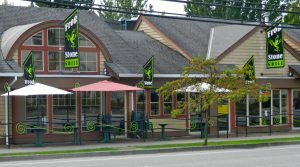 It’s a wonderful family-run restaurant in the heart of Maple Ridge, with another location in Abbotsford as well. Give Julie a call at ValleyFair Dental and get some recommendations of dishes you have to try! Book your appointment at ValleyFair for your whole family. Then head up 227th Street and take a left on Dewdney Trunk Road for lunch. Paliotti’s is near the intersection of Edge Street and Dewdney Trunk Road. They’re open seven days a week, lunch is between 11:30am to 2:30pm and dinner is served between 5:00pm to 11:00pm. The address for Paliotti’s Italian Restaurant is 12018 Edge Street in Maple Ridge. If you’re looking for a casual, modern café in Maple Ridge ─ check out Chameleon Café. Charlotte from our own ValleyFair Dental Staff recommends trying this café for a yummy bite to eat or a romantic date night out. Chameleon is a great combination of a trendy dining room and a vibrant cocktail lounge. Enjoy local and fresh ingredients from local farms and wineries with a changing menu full of innovative dishes. In the mood for seafood? Check out their Pistachio Crusted Halibut or their Pan Seared Scallops and Prawns. For more food recommendations, give our wonderful staff member Charolette a call or ask her for her favourites when you come in for your appointment. She and the ValleyFair Dental staff will be able to recommend some great dishes for you so you have an amazing dining experience. 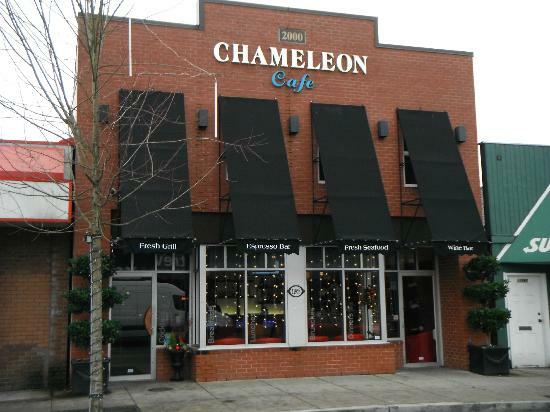 Chameleon Café is located on 11965 24th Street in Maple Ridge for Breakfast, lunch, dinner, coffee or drinks ─ depending on what you’re looking for! If you’re looking for a unique place to grab a bite after your dental appointment at ValleyFair Dental, head down Lougheed highway and take a right on 224 Street. Chameleon is right near the Memorial Peace Park. Helpful tip from Charlotte: If you love wine, visit Chameleon on Tuesdays for 25% off all wine bottles. 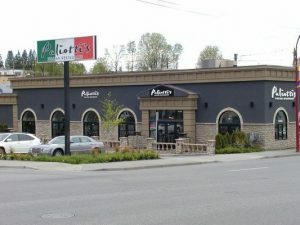 We love Italian food at ValleyFair Dental ─ here’s another great local Italian place for you and your family to enjoy in Maple Ridge. This comes personally recommended by our amazing staff member, Shannon. La Trattoria has been operating in Maple Ridge for over 15 years! This fine dining Italian restaurant has a wide range of pastas, entrees and platters for sharing and can create any original Italian dish for you. A lot of their menu items are created with healthy ingredients that are low in sodium, cholesterol and fat. They also offer gluten free pasta, appetizers and entrees. They have numerous items on their menu, so be sure to check with Shannon when you’re at ValleyFair Dental and get some tips on items she’s tried before. After your dental appointment or checkup at our clinic, grab some lunch or dinner at this restaurant with friends or family. La Trattoria is open for lunch from Tuesday to Friday from 12:00pm to 2:00pm and open for dinner every day from 5:00pm onwards. They are located on 22214 Dewdney Trunk Road in Maple Ridge. From ValleyFair Dental, take 227th Street when exiting the ValleyFair Mall parking lot. Then turn left of Dewdney Trunk Road. 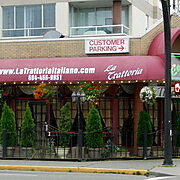 La Trattoria is on the intersection of 222 Street and Dewdney Trunk Road. If you’re looking to feast ─ try Big Feast! It’s is a great small town bistro with a trendy, urban feel. Personally recommended by our friendly office manager, Julie, this bistro is built and run with family and community in mind. The dining room is created to encourage guests to connect, interact and get acquainted. Big Feast believes in shopping local, re-using and recycling! Their display came from a Montessori in Langley, their community table came from a couple in Maple Ridge, their 100 year old bench is from a farm in Northern Saskatchewan and lastly, their chairs came from a bistro in Boundary Bay. Their menus are made locally and they use organic ingredients whenever they can. 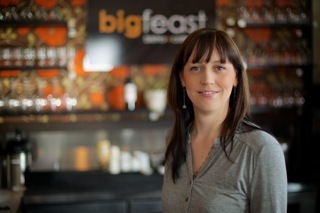 Big Feast supports and nourishes our community and is a great place to go to for excellent breakfast and lunch delights. If you make an appointment at ValleyFair in the early morning or afternoon, stop by this delicious bistro for a bit to eat after your appointment. Ask Julie what her favourite dishes are when you visit us, she’ll be happy to make some recommendations for you and your family. Big Feast is open seven days a week with timings similar to ValleyFair Dental. It’s right on the corner of 227 Street and 119 Avenue outside ValleyFair mall. We hope to see you at ValleyFair Dental soon!